Today, in partnership with Rich Apodaca of Metamolecular, I’m happy to announce the release of a new app for the Apple iOs: Organic Reaction Flashcards for iPhone. It should come as no surprise that one of the greatest difficulties students have in learning organic chemistry is in keeping track of all the reactions. That’s why many of the summary sheets I’ve prepared for the different topics in organic chemistry contain itemized lists of important reactions. It’s also what led to the creation of the Reaction Guide last year, a guide to over 170 of the key reactions in introductory organic chemistry. After receiving several more emails like this where resources I’d developed for one reason ended up being repurposed for another, I started to take the hint: there’s a strong demand for organic chemistry flashcards. Although I don’t regard flashcards as an optimal long term strategy for learning organic chemistry, I’ve recommended them to students who find themselves in desperate circumstances. So Rich and I have put our heads together and built an experimental first version of an organic chemistry flashcards app. The next reaction can be accessed with a swipe. Since each reaction has 3 variables (starting material, reagent, and product) there are 3 ways of testing the same reaction. Each reaction therefore has 4 flashcards associated with it, giving a total of about 120 in all. 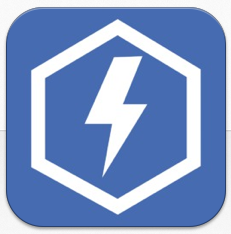 For the moment we regard this app as an experiment. We’re looking for feedback. Is this app useful? What types of features would be good to include? How could it be better? If you could wave a magic wand and add features to it, what would you add? 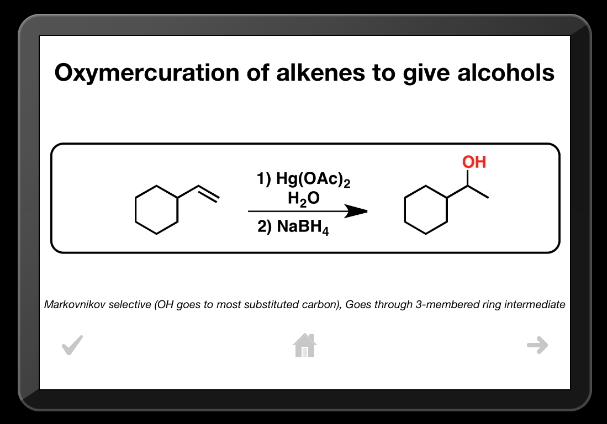 The Organic Reactions Flashcards app is currently available free from the iTunes store. If you download it and try it, please leave a rating! Would love the ability to organize cards into lists. 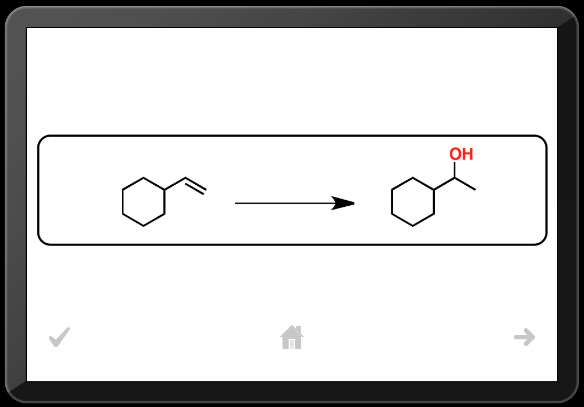 Have some pre-loaded, meaningful lists: Additions to Alkenes, Substitution Reactions, Substitution/Elimination, etc. Letting the user prepare his/her own lists would be great too. E.g. when I was an undergrad, we didn’t talk about oxymercuration, so I’d leave that out of my lists. Make the reactions searchable by name or reagent. Thanks Mike – you’re right, it would be good to have some way of organizing only the reactions you’re interested in. Never thought of it as Evernote for orgo, but that’s a good way to think of it! Wow! I would love to use this… if I had an iPhone! Please make an android app for us! Love this app. I’ve got it on my Ipad as my Iphone died and I’m using an android. I would love to see this in android and I’d love to see more flashcards. I’m willing to pay for it too! When is that available for android users? This app absolutely needs a way to organize only the rxns we are interested in! Having extraneous information to constantly sort through has pushed me to stick with handmade flashcards instead. It is otherwise a great concept.